See coverage of the report in the Wall Street Journal and China Digital Times. Cited in four sections of the 2017 Annual Report of the Congressional-Executive Commission on China. This new report authored by Aaron Halegua and published by the NYU School of Law’s U.S.-Asia Law Institute provides an original and in-depth analysis of that gap—and strategies to narrow it. 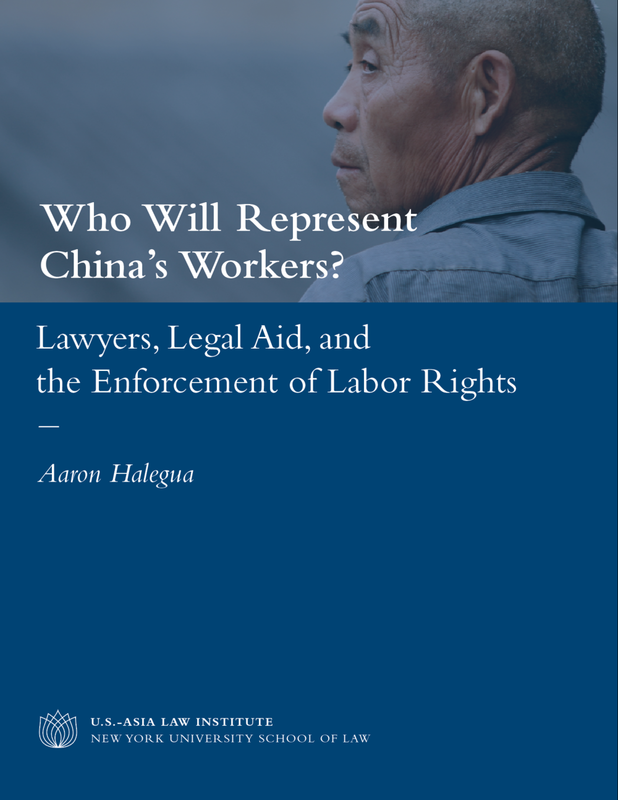 Based on over 100 interviews, observations of legal proceedings, and extensive documentary research, Who Will Represent China’s Workers? Lawyers, Legal Aid, and the Enforcement of Labor Rights examines the legal violations suffered by workers, the range of legal service providers, and how workers fare in litigation. Despite government efforts, problems with unpaid wages, social insurance contributions, workplace injuries, and discrimination endure, which increasingly lead to labor protests and strikes. Workers are also litigating more cases in arbitration and court, but statistics show that they are often unsuccessful. Finding competent legal representation remains a challenge. While public interest lawyers and NGOs are under considerable pressure, law firms are often unwilling to take labor cases and “barefoot lawyers” have been essentially banned. The scale of government-sponsored legal aid has grown significantly, but many workers are still turned away. The report takes a first step towards trying to quantify the resulting representation gap. An analysis of over 30,000 court decisions conducted in collaboration with Legal Miner, a Chinese data analytics firm, revealed that 40 percent of workers are unrepresented in litigation. The report concludes by recommending eight practical strategies for labor advocates, policymakers, and companies to narrow the representation gap and improve the enforcement of labor rights. Some proposals seek to decrease the “demand” for legal services by reducing labor violations in the first place. Others are designed to increase the “supply” of quality legal representation for workers.